A few weeks ago I bought two 5 lb. chickens from the local FFA. They were quality chickens at a great price! But I’ll admit, I was a little intimidated by the idea of cooking a WHOLE chicken. A couple of years ago a friend of mine, who had been to culinary school for a short time, showed me how to cut up a whole chicken. I was so confused and could not duplicate and figured my time with whole chickens was over. But I know they are cheaper so was determined to figure out a way to use them! One thing our family loves is the rotisserie chickens from Sam’s Club. We LOVE them! One of our favorite ways to eat them is sliced up and served over a garden or Caesar style salad. That is such an easy weeknight meal. But I had read that the purchased chickens can be full of fat and sodium. No wonder we love them so! Now back to my FFA chicken. I decided I wanted to try making a rotisserie chicken with my whole chicken but since I’m not always so great keeping chicken I cook from becoming dry I wasn’t sure what to do. Thanks to Google, the answer I discovered was yes! I found a few different versions online and gave it a try. I decided to use the Wildetree Rotisserie Chicken spice blend I already had on hand for my rub. I rubbed it on the outside of the chicken, placed it on some foil balls in the slowcooker (to allow the fat to drip away—another plus b/c it is healthier that way! ), then turned it on to cook 7-8 hours. The kids declared the chicken the best they’d ever had. It needed a little salt but otherwise it was great. Next time I will try using some fresh herbs like rosemary or bay leaves and maybe some sliced lemons to add a little more flavor. This is life changing I tell you. So super awesome I can’t wait to try it again. 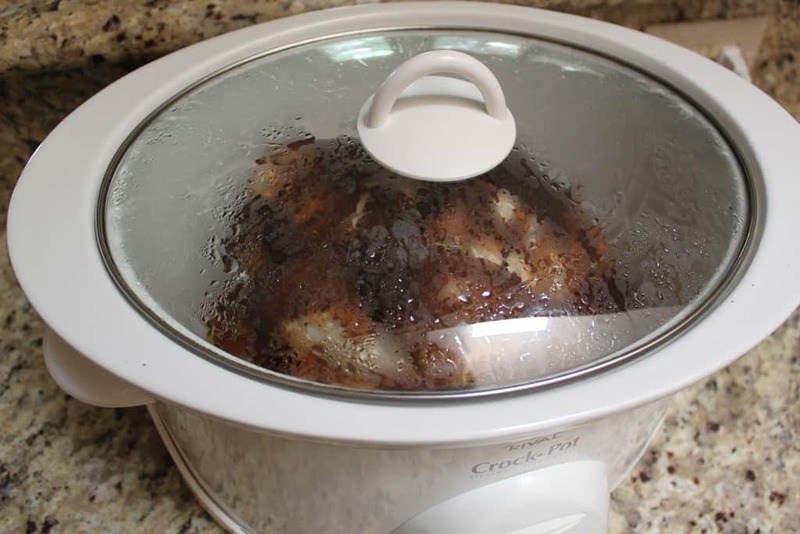 I’m sure you will also declare it the Easiest Ever Slowcooker Rotisserie Chicken too! And what I love about it is that I can make this ahead to have ready when we are at the end of a long day. And I can use the leftovers to make some chicken noodle soup (or whatever uses shredded chicken). Did I say how easy it was? Wash outside of chicken and clean out inside if needed. 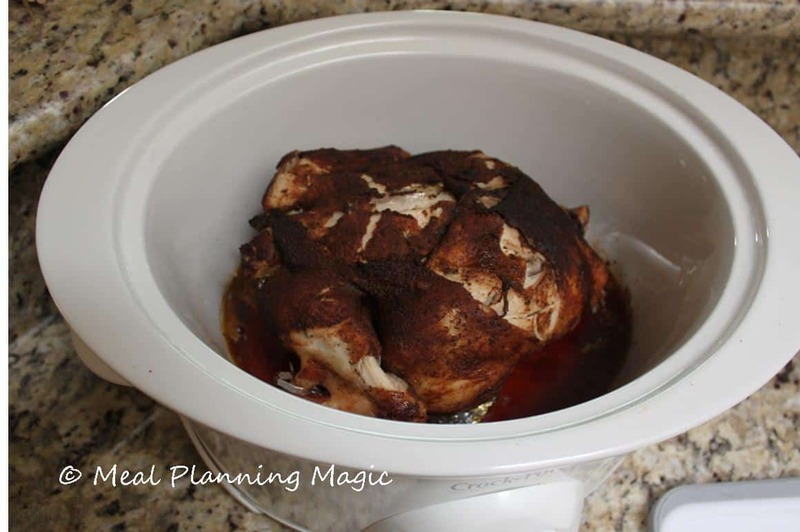 Rub spice rub on chicken and place in slowcooker. Voila! Chicken is cooked and ready to use however you like it! 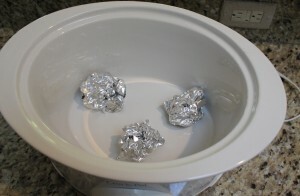 Make three medium size foil balls and place in bottom of slowcooker. Chicken will cook on top and fat will drip down. Spice rub and chicken, ready to go! The chicken is cooking up nicely and retaining its moisture! Seriously? Who knew? Must try this, thank you!! Does it need water to cook for 7-8 hrs? Hi Kulwinder, Nope no water at all! The juices from the chicken keep it moist enough. I had a picture of the juices that remained in the bottom of the slowcooker but it didn’t turn out that great (the photo) so I didn’t post it. Hope this helps! This is easy and I can’t wait to try it! A nice alternative allowing us to eat it during the week besides oven roasters on the weekends. Just put my chicken in the slow cooker. with foil at the bottom. Thank you for the receipe. Awesome! Glad you’re trying it out–let me know how you and your family likes it! Wow! Who knew? 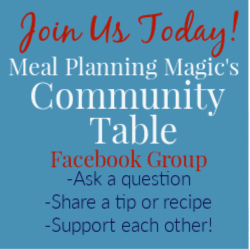 I came looking for a slow cooker recipe and I got a great one from you! Thanks!!!!!! Sounds great, but does the skin get cripsy? Edie, the skin doesn’t get crispy per se but it is still delicious. You could always put a lightweight dish towel or couple of paper towels stretched over the top of the cooker then add the lid so that it absorbs extra condensation. I’ve never tried that with this recipe but have seen it done with others. If you try it, let us know how it works out!